Real Estate Jumps In Chinese City Bordering North Korea Investors from across China have flooded to Dandong, the commercial gateway to the Korean Peninsula. A residential building in Dandong, a city near China's northeast border with North Korea. 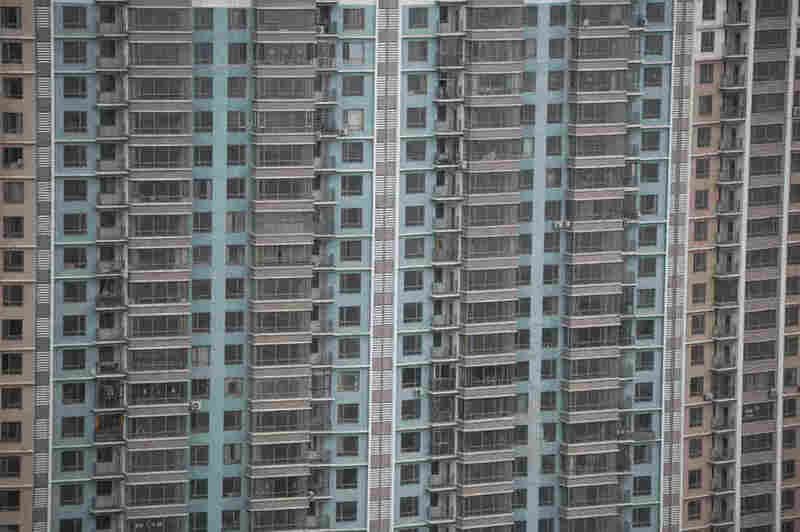 Local authorities have tried to curb speculation in the property market. Occasional trains are some of the only traffic left on the China-Korea Friendship Bridge. This is the crossing point for 70 percent of goods entering North Korea from China — things like coal, fuel and household appliances — which are typically transported from Dandong, a gleaming metropolis, to drab Sinuju, the North's second-largest city. 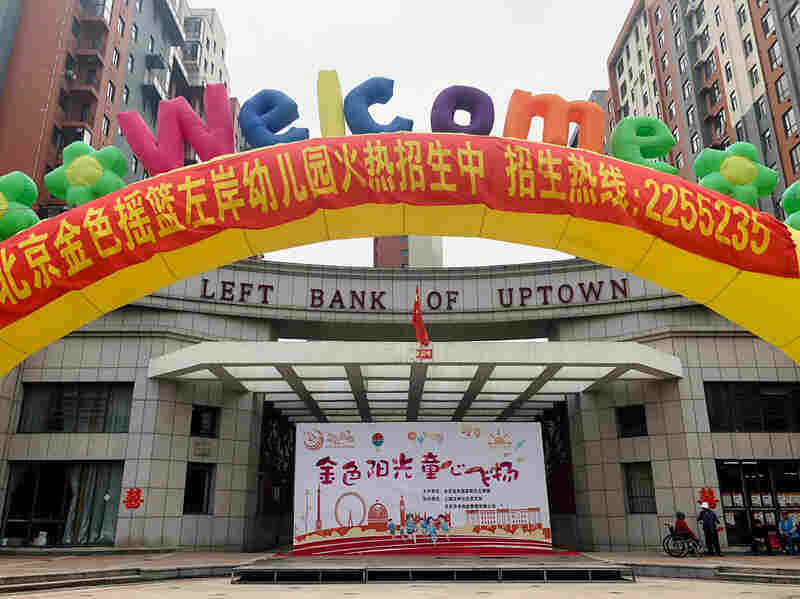 Dandong's new real estate developments like this one, "Left Bank of Uptown," have received a flood of buyers in the past month as home prices rise on the hopes that North Korea, just across the river from the border city, opens its economy. But these are atypical times: United Nations sanctions on North Korea for its nuclear and weapons tests have reduced traffic on this bridge to a trickle. The effects are hitting the economy of this Chinese city hard as well. But in April, Dandong's hopes were suddenly lifted. A historic meeting between leaders of North and South Korea provided raised optimism here that the closed country across the river may soon open for business. The summit planned for next week between President Trump and North Korea's leader Kim Jong Un has added more fuel to the anticipation. And investors from across China have flooded in to this border city of 2.4 million. "They came from Beijing, Wenzhou, and all over northeast China," says Bob Li, a Dandong real estate agent. Li says in the two weeks following the inter-Korean summit, a surge of real estate investors into the city catapulted home prices by more than 50 percent. He promptly began renovating his office to accommodate more customers. "I've never seen anything like this in Dandong," says Li, as workers scurry around him. "We'd have several buyers coming in from all over China buying up apartments. To them, the homes were very cheap, so they would buy as many as possible." And now, a border town suffering from international trade sanctions is back in business, with apartment complexes and Spanish-style villas under construction, despite new rules hastily handed down by the local government to curb speculation and stabilize the spike in prices. A bulk of the sales has taken place near the foot of a massive, new suspension bridge China built across the river to North Korea in the hopes that the North would build a road to it on the other side. So for four years, the four-lane, $330 million bridge has connected the world's second-largest economy to a farm field on the North Korean side of the river. It was supposed to replace the friendship bridge built in 1943 and boost trade. "The rumor around town is that if the North opens up, it'll finally build a road to the new bridge, and our city will be linked to Seoul by road," says Li. "Pyongyang would just be a stop on the way." Visions of a land link between Dandong and an economic giant like South Korea HAVE attracted real estate investors like Mr. Xu. He only gives his surname for fear of getting caught up in local authorities' crackdown on property speculation. Xu just arrived from Shanghai, over 1,100 miles away by land. "Whatever happens between the U.S. and the North is irrelevant," he insists. "It's clear to me that the relationship between China and North Korea is moving forward, and if the North opens up as a result, Dandong will be transformed. This is a port city after all." But local business people remain skeptical. Four men sit outside their auto parts shop in central Dandong, grousing about how outsiders are taking a big gamble by investing in this city. "I just don't think a summit with Trump will persuade North Korea to open up," says a man who only gave the name Yang, for fear of retribution for speaking to foreign media. "Trump's always changing his mind, and we don't know what Kim Jong Un ever thinks, either. The two of them behave just like little children," he says. "Why should we put the future of our city in their hands?" NPR News Assistant Yuhan Xu contributed research to this story in Dandong, China.